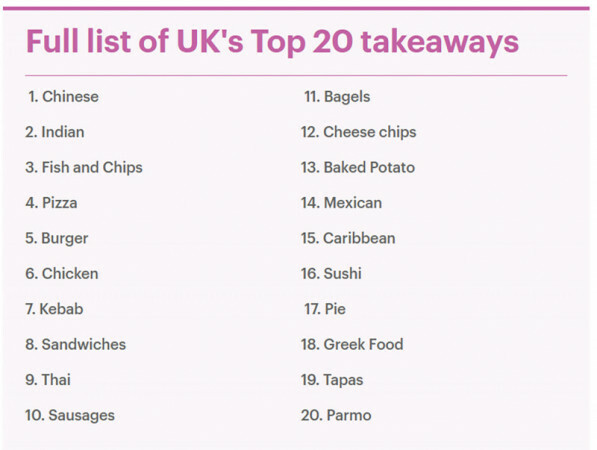 A survey documentary by Channel 5, Britain’s free-to-air television network, has ranked the country’s favorite takeaway options, with Chinese food topping the list, followed by Indian food and fish and chips. And despite Britain’s obsession with pizza, the Italian cuisine only came fourth in the line-up, followed by American-inspired burgers. The show “Britain's Favorite Takeaway” followed the same principle as the previous documentary “Britain's Favorite Crisps,” and ranked 20 of the country's most beloved dishes. Delving into the origins of the country’s favorite foods, it revealed that the first ever Chinese restaurant in the UK opened its doors in 1908, and immigration fluxes from Hong Kong in the 1950s and 1960s made the food even more sought after. Interestingly, the documentary revealed that the fortune cookies that often accompany a Chinese takeaway are in fact a Japanese invention, popularized in the US. One of the most ordered Indian dishes, according to the survey, was Tikka Masala. The UK's beloved fish and chips came third, which might surprise some, as they have been a British staple for the past 150 years.